Nestled near Santa Fe, New Mexico, the fabulous luxury master-planned community of Las Campanas offers an excellent location, astounding residences, gorgeous natural scenery, and much more. This community is the only one of its kind in Santa Fe, and it is comprised of neighborhoods that boast stunning single-family homes and homesites. The community also includes The Club at Las Campanas, which is full of great amenities such as a spa, fitness center, equestrian center, and two pristine golf courses. Available properties in Las Campanas are ready to impress you, so now is the time to consider what it would be like to live in this community. 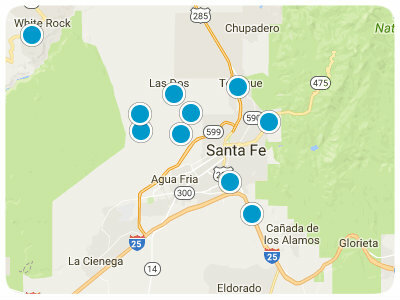 As a resident of this community, you will have easy access to everything the Santa Fe area has to offer. For example, if you like spending time outdoors, then you will enjoy exploring the nearby parks and natural areas. Depending on the season, hiking, ice skating, and jogging are all excellent choices that will help you enjoy the approximate 300 days of sunshine per year. You will also find enjoyable activities indoors near your Las Campanas home. For example, Santa Fe is only a short distance away, and this capital city boasts an eclectic mix of wonderful restaurants. Furthermore, it is also known as a hub for the arts. Regardless of your style, you will enjoy touring interesting museums and exploring impressive art galleries. A local farmers market, annual festivals, and opportunities to appreciate the breathtaking scenery of the area are only a small sampling of additional benefits you will find in this area. No matter where your adventures lead you, you will be content to think of your Las Campanas single-family home waiting to welcome you back. A convenient location, luxurious amenities, and friendly neighbors are only a few examples of what you will enjoy about living in this community. Homes for sale in the Las Campanas community are ready to pique your interest, and you are sure to find something that suits your style. If you are ready for more information regarding Las Campanas single-family homes and homesites for sale, please do not hesitate to contact us.